Create your own cozy corner of paradise on earth. Help the poor animal again become a cheerful, well-fed and happy. 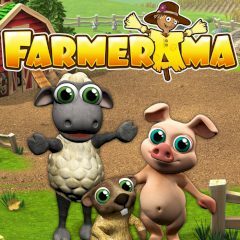 In this game you find yourself on a farm, it's success depends on you. Roll up your sleeves and start to sow the fields, harvesting and caring for animals. You have to work hard! You are walking through the fields, enjoying the sun shining and beauty of the nature. Suddenly, you saw the owl, and she speaks like the humans! The owl showed the big farm with poor and tired animals. The owner of this farm disappeared mane years ago. So, as you have already understood, your task is to make everything that this big farm can return to the life. Care about animals, plant your fields and harvest it. It is up to you to make this farm successful and beautiful. If you wanna to become really cool, then choose this game and start to work.